Store multiple fishing rods, nets, vests, paddles, etc. The Trifecta Fishing Rod Rack is an excellent choice for the fisherman on a budget. Constructed of molded ABS plastic, the rack is lightweight enough to hang on any wall, but strong enough to handle a full compliment of fishing rods, paddles, long-handled nets, and vests. It's versatile design allows you to rest longer items (rods, paddles, nets) across 1 of 3 arm tiers, while still leaving room for vests, life jackets or raincoats to hang off the arm ends. The design is an "I - beam" style, a very lightweight yet strong construction method used in many buildings. The rack storage surface is made with a slight angle which ensures your rods will not slip out and also provides a nice viewing angle. The area where the mounting screws affix the rack to the wall is nicely hidden and also has a thicker piece of plastic for extra support near the mounting area to make sure the screw heads don’t rip out. The design also lends itself neatly to being stacked on top of each other. 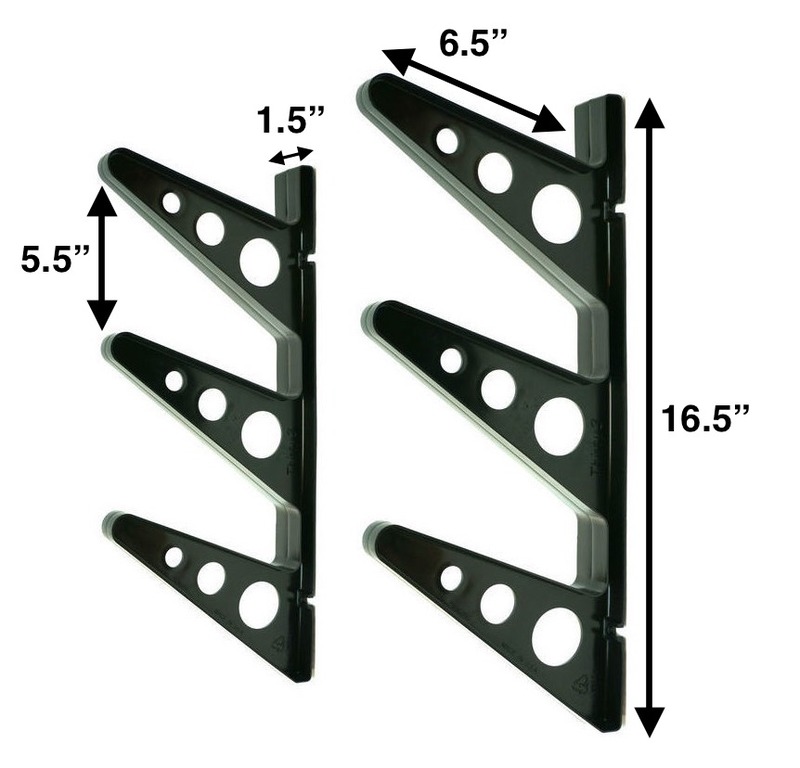 It is very common for customers to order 2 or 3 of these racks and just stack them up to hold up many fishing poles, nets, paddles or even rowing oars. A favorite multi-sport rack. Since each side of the rack is independently mounted you have plenty of options for what gear to hold. Skis, paddles, skateboards, hockey sticks and lacrosse sticks are favorite items to store in addition to fishing poles.